Unfortunately the condition of this little toy Rolls-Royce isn't the best, but as its a little unusual I thought I'd show it here anyway. 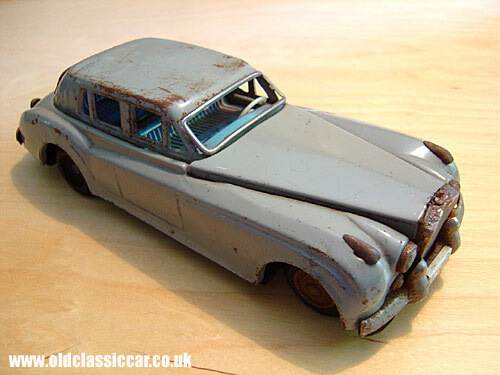 It looks to be based on the Silver Cloud 1 or II, a car that first saw light of day mid 1955 and was sold until 1966. No makers name is shown on this toy, just the name "Rolls-Royce" is pressed into the baseplate. The motor is a friction drive unit, mounted in the boot. It looks like it is of Japanese or Hong Kong manufacture. The chromework on this toy isn't too clever and it shows plenty of active use! The interior is lithographed tin, and the separate steering wheel made from plastic. Quite how R-R would have reacted to this model being graced with their brand name is anyone's guess.